Have you ever seen something like this? (Mind my handwriting.) It’s basically an outline of your plot, what happens in between, and how many words you’ll spend on each part. There’s Exposition (in which you explain the characters, the situation, etc. It’s optional), in which I’m using 1,000 – 3,000 words. 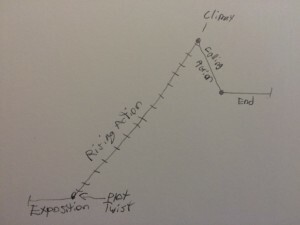 Next is an optional Plot Twist (which isn’t in the photo), which should begin your Rising Action. Take The Hunger Games, for example – the Plot Twist after the Exposition is Prim getting reaped, and then Katniss taking her place. Afterward, the Rising Action begins as she and Peeta go to the Capital.Next is (as I mentioned above) Rising Action. This should take up a majority of your novel, as it is all the little things that happen in between the Exposition and the end.At the end of the Rising Action should be a Climax. The Climax is basically the “turning point.” I.e., the battle ends. Next is Falling Action. Things should begin winding down before your ending. BUT WAIT, THERE’S MORE! The photo on the left is a general plot outline; if you followed it exactly, your plot may wind up being boring! Play with your outline, give it bumps. Make it fun for both the writer and the reader. Aim high! Put your word-count-goal 5,000 – 10,000 words higher than you think you can do; you’ll surprise yourself. Because of the limited time during NaNoWriMo, you probably won’t have much time to brainstorm during the writing. So it’s better to plan before November hits. By this I mean list your characters (including their physical appearance – you’ll find that you probably will forget eye colors and other little details, especially if you have a lot of characters), list EVERY idea (yes, even the crazy, this-could-never-possibly-happen ideas) you can think of, write down your basic plot in the form of a draft summary. Doubt will likely creep into your mind. Thoughts such as, this isn’t good enough, or maybe I should just give up. DON’T LISTEN TO YOUR DOUBT! This is crucial. You will certainly regret dropping your novel, but after all, NaNoWriMo only happens once a year. Last year Kami Garcia wrote a NaNo pep talk, in which she said, “Giving Doubt a name is helpful. I call my unwelcome friend Ozzy because he sounds suspiciously like Ozzy Osbourne from one of my favorite bands, Black Sabbath.” I’d chosen the first name that popped into my head (David), and I used that to shoo my Doubt away. 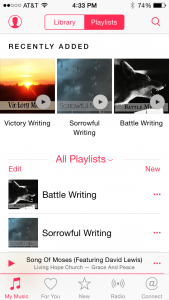 Create playlists for writing. For example, I have playlists like, “Victory,” “Sorrow,” and “Battle.” I play these during scenes that are victories, sorrowful or intense. It helps you pick up on the mood of your writing, and it will probably even improve it. 6. Write like a boss or not at all! This isn’t just my blog’s slogan, and it isn’t just something I came up with off the top of my head. 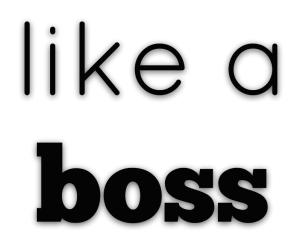 “Like a boss” means to do something in an excellent, outstanding way. 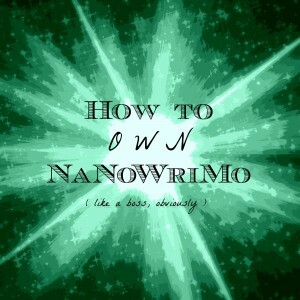 So use this crucial line throughout NaNoWriMo, and you’re sure to totally rock your novel!